The American Legion is the nation’s largest wartime veterans service organization, committed to mentoring youth and sponsorship of wholesome programs in our communities, advocating patriotism and honor, promoting strong national security, and continued devotion to our fellow servicemembers and veterans. 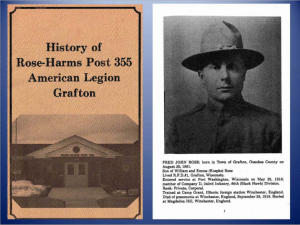 Since the first meeting of Grafton’s Legion Post #355 in 1934, our members have strived to support veterans and our community. We offer public events and provide assistance to other organizational programs and events. Plus, our post facilities and equipment is available for rent. The American Legion’s success depends entirely on active membership, participation and volunteerism. Our legion family consists of The American Legion, The American Legion Auxiliary, Sons of The American Legion and The American Legion Riders. Information about our family organization is available to anyone who has an interest in joining this fantastic organization. Select the image below to read more about the history of the Rose-Harms Post 355 American Legion.